Sermons on Prayer look at the different types of prayer - adoration, confession, thankfulness and supplications. This sermon looks at prayer from a different perspective - prayer as change! We know that prayer is communication with God—God of the Bible. God communicates with us through His word and we communicate with God through prayer. And the beauty of prayer is that God hears us. He hears us because He is always present—the theological term we use is omnipresent. Most of us know that prayer involves adoration, confession, thankfulness and supplication. However, I want to look at prayer from a different prespective - do we know prayer as change? 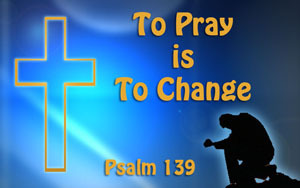 Someone once said, "To pray is to change!" Do we pray to change? Someone said this, “During prayers of examination we invite the Lord to search us out and know us and let us know the outcomes.” Look at Psalm 139! Let's face it - God knows everything about us. We cannot hide things from God! What are some prayers of examination? Lord, am I insensitive, am I prideful, am I self-centered, am I forgiving or am I bitter about something? Let's look at three examples of prayers of relinquishment. “Not my will but yours be done.” There was a struggle, dialogue with God and finally a choice to be made - Jesus chose to surrender His will. Are you willing to surrender your will to God? Job struggled to understand, he talked to God and finally he made a choice - He chose to surrender all to God regardless. When Job handed all over to God, a transformation took place (Job 42:2, 5-6). When Paul stood before the Roman court to give a defense of the charges against him, no one stood with him and supported him. Not one Christian in Rome stood beside him to advise him or support him. Why? We don’t know why? Paul doesn’t tell us. Perhaps they were afraid. Perhaps they were too busy. Perhaps they were out of town. Perhaps they just didn’t know about it. We just don’t know. But what we do know is that Paul was abandoned. Imagine the emotions running through Paul’s mind. Just when he needed some friends, it seems they all abandoned him. That must have really hurt. But notice Paul’s reaction! Look at the end of verse 16, “May it not be charged against them.” Paul makes a deliberate choice not to become bitter about this. Sometimes, when we work together with God and each other, people will let us down but we are not to get vindictive. We need to have an understanding spirit like Paul—a spirit that relinquishes hurt and disappointment. What are prayers of rest? You know, we are a stubborn bunch at times. We want to do it ourselves. But the reality is we can’t. We can’t save ourselves and we can’t carry some burdens. Do you pray prayers of examination? Do you pray prayers of relinquishment? Do you pray prayers of rest? For more on prayer, click on the different types of prayer.